I like to stuff things. Strawberries, more strawberries, cookies, more cookies, rice krispie treats…you name it, I can stuff it with something. 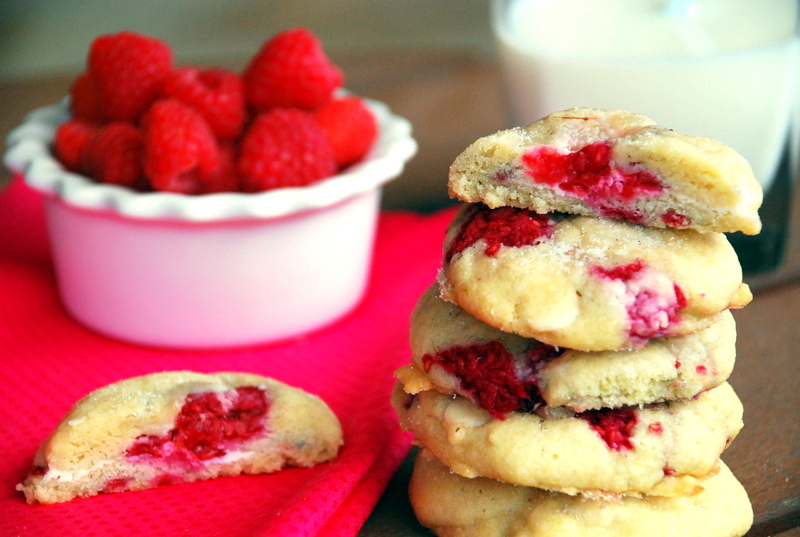 I’ve been wanting to do a raspberry cookie for a while, mostly because I don’t see them around much, and I thought it would be extra yummy to stuff it with something. Unfortunately, my husband bought me reduced-fat cream cheese at the grocery store (Why did I marry the healthiest guy on the planet? I practically bleed butter!) so I wasn’t sure it would work. But it worked. Oh, it worked. These cookies are so light and fluffy I could eat them for breakfast. A crisp sugar shell leads the way to a punch of raspberry-studded buttery goodness, throw in some hits of white chocolate and — oh yes — a cheesecake surprise in the middle. The raspberry extract makes a huge difference in these. You can find it right next to the other extracts (vanilla, lemon, peppermint etc.) in the baking aisle. These were a very good experiment. Make them. Preheat the oven to 350 degrees and position a rack in the center. Line your baking sheets with silpat or parchment paper and set them aside. Use an electric mixer to cream butter and sugar until light and fluffy. Add both extracts and eggs and beat until combined. In a separate bowl whisk together the baking soda, baking powder, salt and flour; gradually add to wet ingredients. 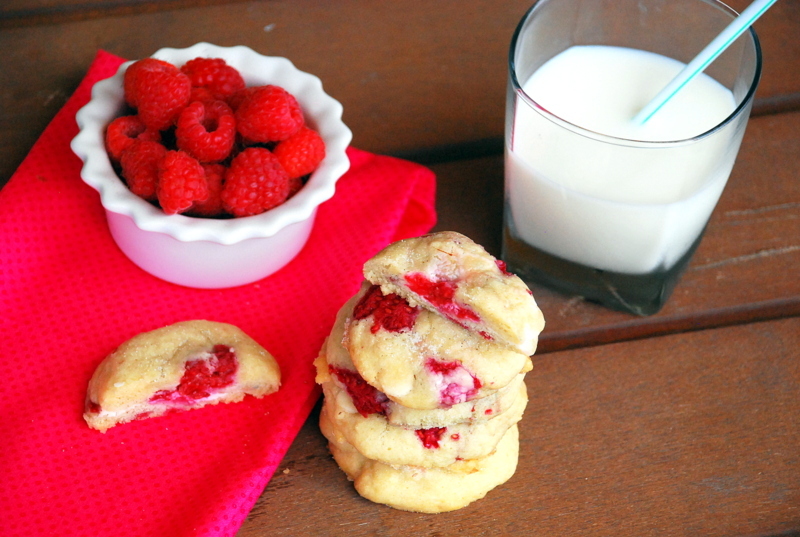 Fold in white chocolate chips, then GENTLY fold in the raspberries trying not to burst too many. Refrigerate the dough for about 15 – 20 minutes to make it stiff enough to roll with your hands. Roll dough into a round ball, then flatten slightly. Bake for 10 - 14 minutes until the edges JUST begin to turn golden and cookies are set in the middle when you shake the pan. (Do not overbake these, cookies should be nice and pale like a sugar cookie.) Remove from oven and dust with sugar. Transfer them to a wire cooling rack and cool completely.